Eugène Boudin was born in Honfleur on the French Normandy coast as the son of a steamship captain. As a young man he opened a framing shop in Le Havre, where he met Jean-Francois Millet, who encouraged him to become a painter. Boudin then moved to Paris and came in contact with artists of the Barbizon School. Largely self-taught, he preferred working directly from nature. 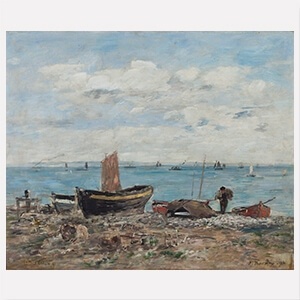 His main subjects were seascapes, and the harbours and beaches of the Normandy coast, especially focusing on the changing effects of weather and light. Therefore, Camille Corot called him “the king of the skies”. In 1858, Boudin introduced the young Claude Monet to plein air painting. 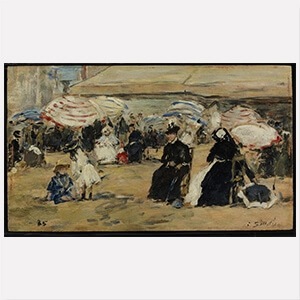 He is regarded as a forerunner of Impressionism.